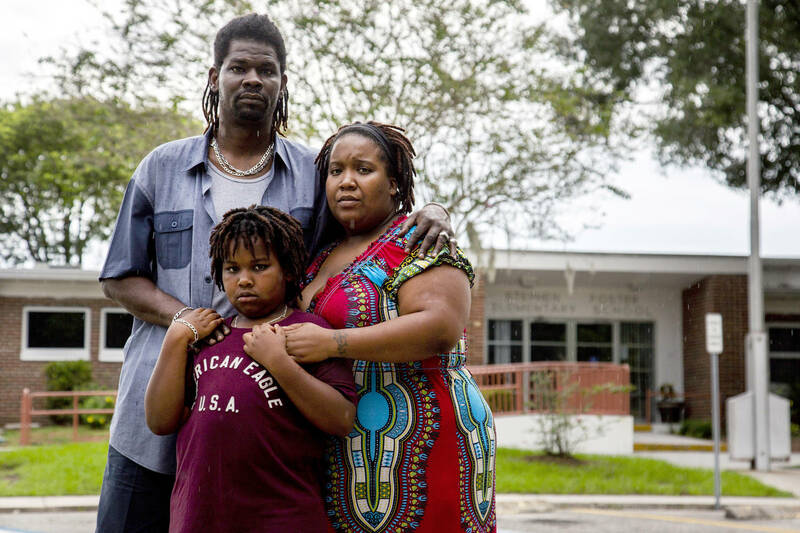 Patrick and Lakesha Anding stand with their son, DáVeon, 9, near their home across the street from Stephen Foster Elementary in Tampa. Patrick Anding was angry when he learned that the district kept lead test results from parents and teachers. The district announced the results last week, three days after the Times began asking teachers and principals whether they knew about the lead levels in their classrooms. By then it had ignored for 16 months federal recommendations that said it should disclose the testing. It still hasn’t released the vast majority of test results, including more than 70 showing lower levels of lead that researchers say still can be dangerous for children. Many of the high results were in water fountains that teachers and students drink from every day. Others were in kitchens, where food cooked in lead-tainted water can easily soak up dangerous levels of the poison, experts say. The district’s staff also did not tell the School Board about the testing, members said last week. Students head back to class Friday with the scope of the problem undetermined. At the start of the week, only 51 schools had been tested. Some lead was found in every one. About a dozen other schools fall into a special category that must be tested by law. 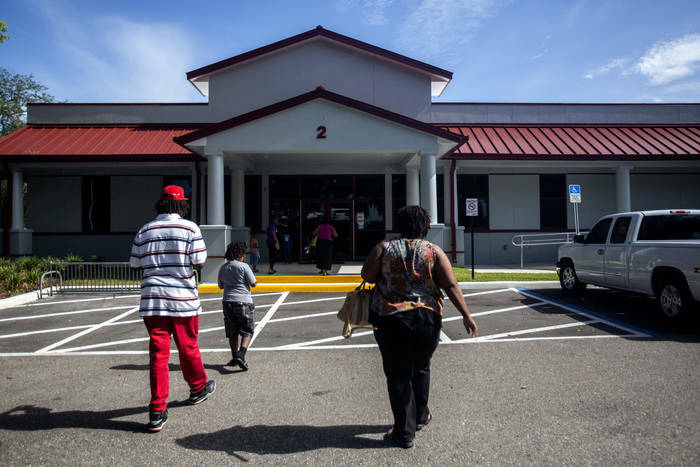 That leaves nearly 75 percent of Hillsborough’s roughly 230 schools unchecked. Almost 100 of those campuses were acquired before 1986, when federal law reduced the amount of lead allowed in piping, district data shows. Although new schools can have lead problems, old schools are at the highest risk. Consuming trace amounts of lead can have life-changing effects on young children. It invades their developing brains and shrinks areas that govern attention, comprehension, reasoning, aggression and impulse control. It can warp red blood cells, limiting their ability to carry oxygen. It can lurk in the body for decades, clinging to bones like a belligerent squatter, then release into the blood years later and resume its attack on vital organs. 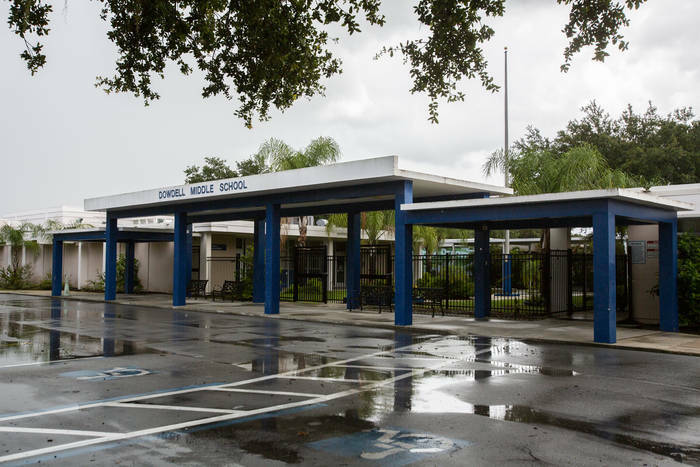 To examine Hillsborough’s efforts to protect students from the toxin, Times reporters built a database of nearly 1,800 test results and reviewed hundreds of pages of internal reports and emails, spanning from the inception of the district’s testing program in 2017 to mid-July. Twenty-seven drinking fountains, sinks and plumbing components were identified with lead levels that reached or exceeded 15 parts per billion, the Environmental Protection Agency’s “action level” for public water systems. The district has publicized the 21 schools with those fixtures since last week, and said it had fixed each location. Generally that meant replacing a water faucet or fountain. Another 14 schools had test results of 5 ppb or higher, which is the Food and Drug Administration’s cutoff for bottled water. That included 16 sinks and fountains with results over 10 parts per billion. In its announcements, the district listed none of those results and gave the schools a clean bill of health. “No issues were identified,” it said. There is no sign it has attempted to lower those lead levels. The Times is publishing a database of all the results online. In an interview with the Times, deputy superintendent for operations Chris Farkas and district communications chief Grayson Kamm acknowledged the district erred by not telling parents sooner. It is now releasing some results as they come in. Chris Farkas, deputy superintendent for operations, in a conversation at Monday's back-to-school news conference. Grayson Kamm, communications and media officer for the school district. 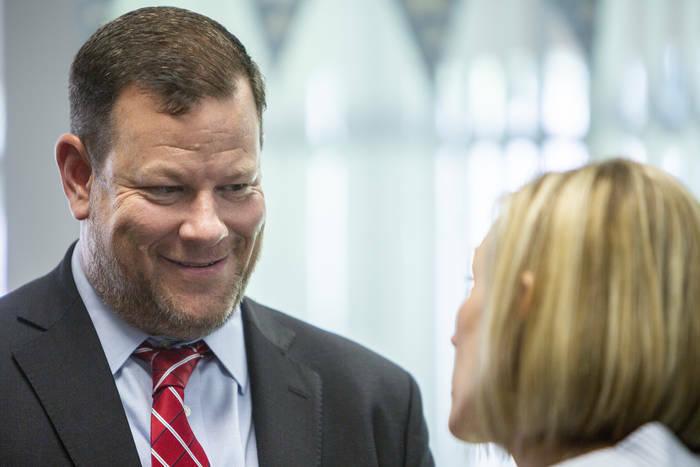 LEFT: Chris Farkas, deputy superintendent for operations, in a conversation at Monday's back-to-school news conference. RIGHT: Grayson Kamm, communications and media officer for the school district. Kamm and Farkas said the district should be credited for testing, which is not required by law. “If I was going to hide something, why would I test at all?” Farkas said. 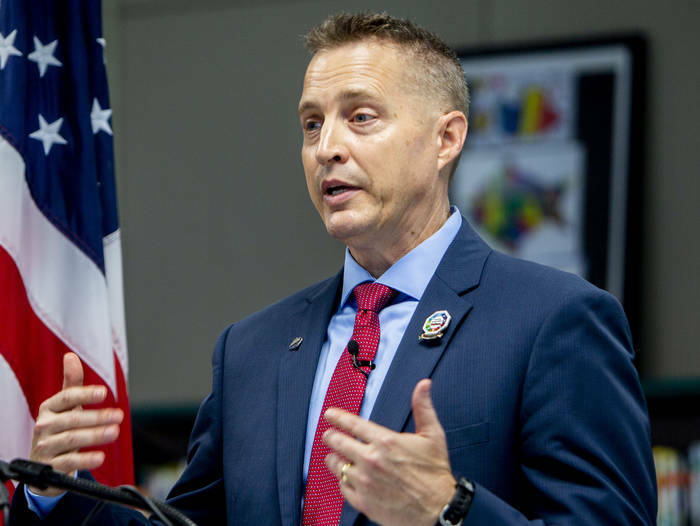 Superintendent Jeff Eakins declined a request for an interview. The Hillsborough County Department of Health praised the district for testing. “Based on the levels found, someone would have to drink a lot of water for a long time to be at high risk of getting sick,” it wrote in a press release. Scientists who study lead described the results as far more concerning. “There’s no place in the human body for lead,” said Virginia Tech professor Yanna Lambrinidou, who helped expose lead problems in Washington, D.C., and Flint, Mich.
None of the results in Hillsborough are as high as the levels found by schools in older cities like Philadelphia and New York. They also are not nearly as high as those in Flint, where some homes had levels above 13,000 ppb. But the Centers for Disease Control and Prevention, the American Academy of Pediatrics and even the EPA, which set the 15 ppb limit, say that any amount of lead in drinking water is unsafe. Bruce Lanphear, a professor and top lead researcher at Simon Fraser University in British Columbia, Canada, said drinking regularly from a water fountain with levels as low as 5 parts per billion can harm children. He said the district should work immediately to lower sinks and fountains below that limit. “In the long-term, they should strive to have levels below 1 parts per billion,” he added. Children exposed to low levels of lead don’t immediately exhibit dramatic symptoms. Instead, the poison irreversibly chips away at their brains and then can disappear from the blood quickly, making it difficult to determine whether a student has been affected. The only way to protect children from additional harm is to move swiftly to end their exposure. Before the district’s July 31 announcement, Times reporters interviewed 18 parents whose children attended some of the tested schools. All said they were unaware of the lead testing. Several said they wished they had known so they could have gotten their children’s blood tested or sent them to school with bottles of water. Last week, Anding took DáVeon to the doctor to have his blood tested. The tests came back Thursday. They were negative. The Andings walk toward Tampa Family Health Center. At the center, DáVeon waits to get his blood drawn for a lead test. LEFT: The Andings walk toward Tampa Family Health Center. 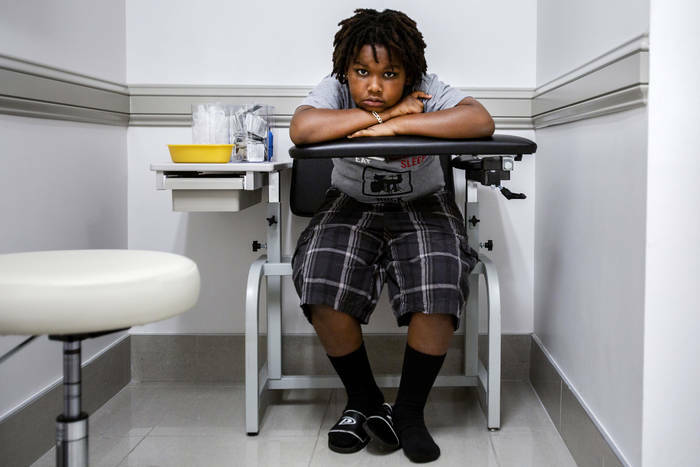 RIGHT: At the center, DáVeon waits to get his blood drawn for a lead test. He winces with the needle in his arm. No one forces Florida’s school districts to test their water for lead. A federal law requiring districts to purge the neurotoxin from classrooms was overturned by an appeals court in 1996. But the EPA strongly recommends that schools test drinking water. California, Illinois, Maryland, Minnesota, New Jersey and New York now all require school systems to test. Florida law requires school leaders to protect children’s health and safety but says nothing specific about lead. Addressing the School Board last week, Farkas said he launched the testing program in 2017 after seeing it done in other districts. 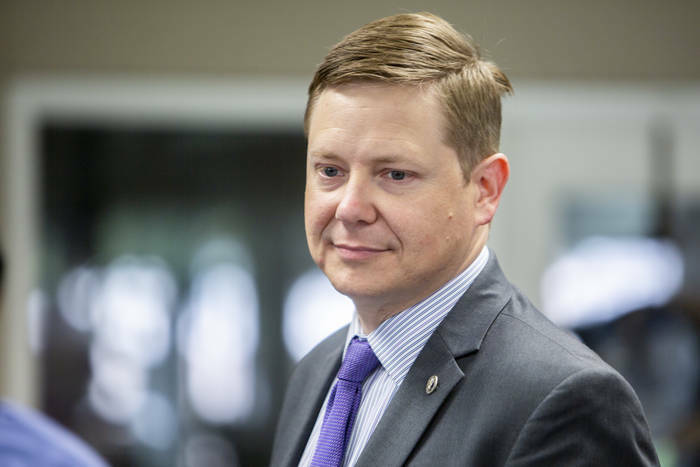 In the interview, Farkas acknowledged the testing also began 35 days after a Times reporter sent the district a records request for documents showing whether lead existed in piping at 11 schools. He said a number of factors weighed into his decision, including the situation in Flint, a visit to another school district and the questions the Times was asking. Eleven of the first 13 schools the district tested were the ones asked about by the Times. The district then continued examining campuses starting with older schools. The district’s assessment of some buildings was blunt. “Fairly certain that lead may be present,” said a report on the plumbing in a 59-year-old building at Lomax Elementary. Nonetheless, the effort moved slowly. Over 16 months, the district tested about three schools a month. It almost never tested more than one school at a time and sometimes waited two or three weeks before starting the next one, according to a Times analysis. Before the district announced the testing last week, it was on track to finish checking in late 2022. Farkas said his three testers had too many other responsibilities to move more quickly. The district now expects to test all schools that are 40-plus years old by mid-December, he said. It announced at least three more tests this week, but reported no results because it found nothing over 15 ppb. The highest results have been recent. In March, a prep sink at Sgt. Smith Middle School in Citrus Park tested at 217 ppb. A kitchen hand sink at Mitchell Elementary in South Tampa came in at 224 ppb. The district could not immediately say whether those sinks were used for cooking. Washing your hands with lead-tainted water is safe, experts say, but cooking with it is not. Vegetables can absorb 90 percent of the lead contained in the water they are cooked in. Over the last several years, the potential hazard posed by poor drinking water has been compounded. Because there is not enough money in Hillsborough’s budget for routine maintenance, school air conditioners frequently break down in buildings that lack other ventilation. On a hot day, classroom temperatures can surpass 80 degrees. As a result, children are spending more time at the water fountains. 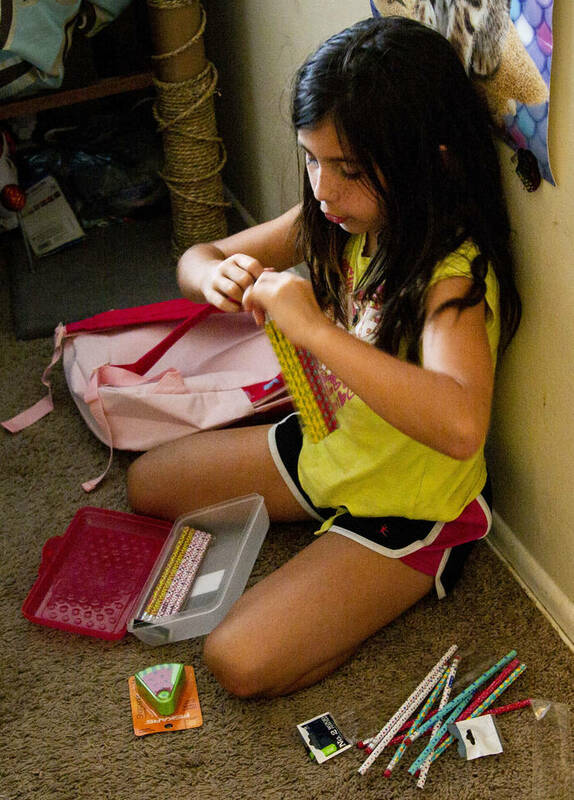 “They drink before and after lunch, before and after recess, and when they're up and moving to another activity,” said Susan Kirby, a Northwest Hillsborough mother of a rising second-grader who routinely volunteers in classrooms. It is “horrifying,” Kirby added, to think that water cannot be trusted. 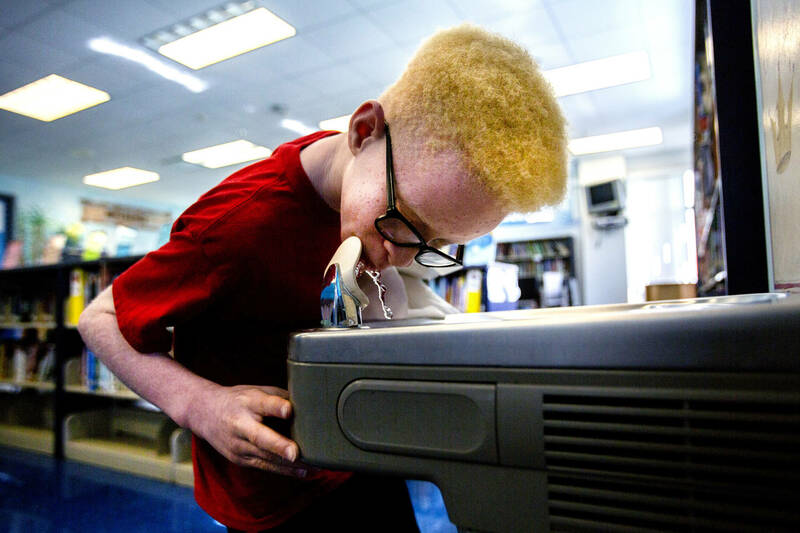 “I’m sending him with bottled water”: Anthony Johnson, 12, a sixth grader at Jennings Middle School, drinks from a water fountain at Sheehy Elementary School in Tampa recently. Very little lead has been found in drinking water at Sheehy, but fountains and sinks at Jennings have yet to be tested. “I’m worried that on his first day if there will be lead in the water,” said Cherylene Levy, Anthony’s grandmother. Levy says she will send Anthony to school with three bottles of water every day and has told him not to drink from water fountains. 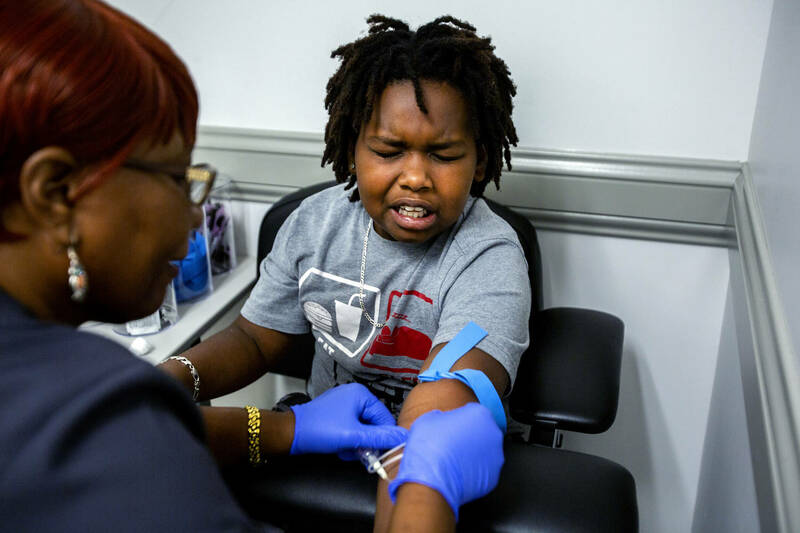 In the schools the district tested, it left many locations unchanged that had lead levels that every major health authority would categorize as unsafe. The district touted its approach as going beyond what the EPA suggests for schools. Farkas pointed to an EPA recommendation, posted online, that schools address water sources that exceed 20 ppb. But the EPA has also said its limits were never meant to indicate a safe amount of lead. They aren’t based on science or medical research. Fifteen parts per billion, for example, was the “action level” proposed in the 1980s because some water utilities couldn’t afford to buy enough chemicals to combat pipe corrosion more aggressively. And when the EPA first set the 20 ppb level in the 1980s, it admits it “did not have information available to recommend an action level specifically designed for schools,” according to a July report by U.S. Government Accountability Office. Since then, scientists have come to universal agreement that there is no safe level of lead. In the report, the GAO criticized the EPA for its “misleading and unclear” guidance around the 15 ppb and 20 ppb levels. It said the federal agency’s language suggested the benchmarks were protective of health, when they aren’t, nor were they ever intended to be. It concluded the EPA put school districts at risk of making “uninformed decisions” and recommended that the EPA revise its guidelines. The EPA agreed in a reply. When read excerpts of the report by the Times, Farkas said he would consider the issue, but also defended the decision to use the EPA limit. “When we look at a federal agency that’s responsible for it based on law, that's definitely the one we follow,” he said. It easy to understand why scientists don’t consider 15 ppb safe. Lead exposure is cumulative, Lanphear told the Times. The harm to children is the same whether they take one sip of water with 16 ppb lead or two sips of water with 8 ppb. One Chicago study found kids with low-level lead exposure scored significantly lower on standardized reading and math tests and were 30 percent more likely to fail third grade. Lamphear says a child who drinks a few sips every day over the course of a school year from a water fountain spewing 5 ppb of lead could lose at least an IQ point. The district ignored at least 60 sinks and water fountains with higher levels than that. 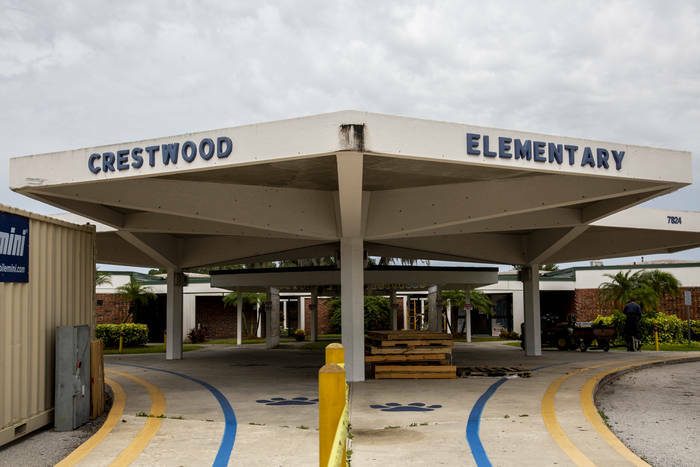 At the nearly 900-student Crestwood Elementary, the fountains in pods 400a and 500a contained lead levels of 6 ppb and 8 ppb. The levels in a writing resource classroom approached 12 ppb. Records show no steps to reduce the lead in those rooms. At McLane Middle, lead levels in four sinks that ranged from 8 ppb to 12 ppb went unaddressed by the district. A water fountain in building 500, however, tested at 18 ppb. The fountain remains at McLane with a filter installed. Records show no sign of any follow-up test to make sure the filter worked. Some results seemed to point toward a larger problem. Take a sink in music room 102a at Dowdell Middle. The water in the sink tested at 15.8 ppb last November, high enough for the district to address. Maintenance workers believed the culprit was the faucet, emails show. Over the next three months, they switched the fixture and tested two more times. First, the lead level increased to 17 parts per billion. Then results skyrocketed to 47 parts per billion. Maintenance concluded the problem might be the replacement. After the insertion of a third faucet, the lead results dropped to 12 ppb — still high, but below 15 ppb. Satisfied, the district staff moved on. Three more sinks at Dowdell tested above 5 ppb, including a classroom sink at 12 ppb. In those cases, the district did nothing. 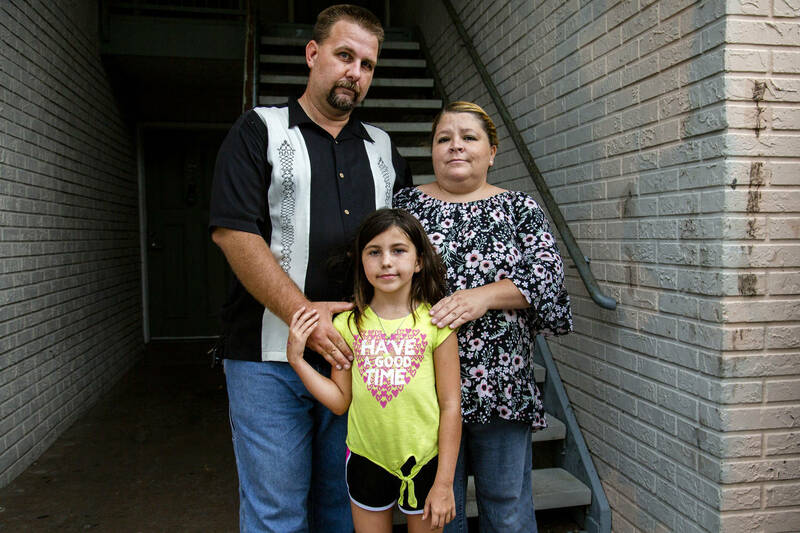 “Why wouldn’t they let us know?” For several years, Faith Moore, 10, attended Crestwood Elementary, where lead levels over 5 parts per billion were discovered in several fountains. Her parents, Philip and Alice, said they plan to bring her to see a doctor. This year, Faith has transferred to Egypt Lake Elementary, which has not been tested for lead. “You have to ask yourself if that school is any better or any worse as far as the water,” Philip Moore said. On a recent Saturday, Times reporters visited the homes of several teachers who work in classrooms where the district found lead in a sink or water fountain. The teachers declined to comment, but some were surprised to hear the news. Three days later, the district announced the testing results. The EPA says it’s best to inform the school community and public before a district tests, after the results are received and whether corrective steps are or aren’t pursued. Of at least eight states that require school lead testing, six require the public disclosure of all results. Some districts post every result online. It’s not that Hillsborough didn’t think of telling parents. Kamm said his department had always planned to make the announcement before children returned to school. But he also knew the Times was working on a report and wanted the district to break the news. “I don’t want people to think we’re hiding anything,” he said. That’s why emails went out on July 31 — an especially busy day, with President Donald Trump visiting Tampa Bay Technical High School. Farkas said the notification effort was delayed in part because the district was trying to involve the county health department, including using the health department’s logos. In his remarks to the School Board, Farkas apologized to angry board members for keeping them in the dark. It’s not like Hillsborough hasn’t done that before. It runs its own water plants for roughly a dozen of its schools that aren’t linked to a municipal system. The district has been required for decades to test that water for lead and to provide all results to the public within 30 days. Early in the recent testing, the question came up of whether that could be a model. In April 2017, Derek Maples, the assistant director of maintenance who was supervising the project, asked maintenance general manager Bob Wegmann how the results would be shared. “I was wondering what role Michael or I will play in communicating results of our voluntary water sampling to the affected schools,” he wrote, referring to another manager. He attached a memo from the county health department and a detailed disclosure of testing results the district used in a school where it provides water. “Something similar could be utilized to address the communication component of our voluntary sampling program,” he suggested. Wegmann’s reply was short and direct. Contact Corey G. Johnson at [email protected]. Follow @CoreyGJohnson. Contact Marlene Sokol at [email protected]. Follow @Marlenesokol. Contact Eli Murray at [email protected]. Follow @Eli_Mur. Times photojournalist Brontë Wittpenn contributed to this report. Contact her at [email protected]. Follow @BronteWittpenn. Designed by Martin Frobisher and Eli Zhang. This story was updated on Aug. 10 to reflect the following clarifications: An earlier version of this story misstated how long it would have taken the district to complete testing at its previous rate. It also said in one location that Faith Moore still attended Crestwood, when she has transferred to another school.